Our Big Winter Sale has been extended until January 31, 2012! Our sale has been extended! It's happening again! Our biggest greenhouse sale of the year! Backyard Greenhouses is pleased to offer a 10% discount on greenhouses and lean-to home attached models purchased before January 31, 2012. This 10% discount applies to our already marked down Feature Greenhouses that are featured on sale everyday! For example, our Feature Patricia single glass greenhouse measuring 8' x 12' is already offered at a reduced price offering $759.00 in savings. 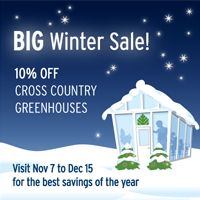 Combined with our BIG Winter Greenhouse Sale, you'll now save $1,178.00! Special Note: This limited time offer does not apply to the Sun Garden and Legacy Feature Greenhouse Models. These models are eligible to receive a 5% discount. In addition to our Feature Models, the 10% discount is eligible on all other purchases, based on the original pricing. The 10% discount does not apply to sale pricing listed on other greenhouses and will apply to regular pricing only. Shipment of the greenhouse must be made prior to February 29, 2012. Backyard Greenhouses cannot delay fabricating the greenhouse for shipping purposes and greenhouses will not be stored.